When people see this photograph, their first question is "what is it?" I enjoy entertaining their guesses, then revealing the "answer": eucalyptus bark shot on Maui. It wasn't until two years after this picture that I learned the particular species: deglupta. Immediately I did a little research on the Internet, found over 160 websites that refer to the deglupta variety of eucalyptus, and realized what a vast amount of knowledge exists about a single family of trees. Others have catalogued myriad details about this plant species: hardwood characteristics, suitability for furniture, ideal growth climate, etc. 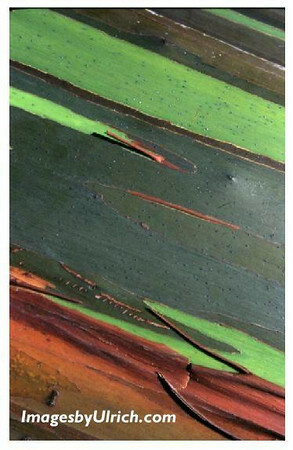 Yet the more I learned about deglupta eucalyptus in the abstract, the less I knew about this photograph. Gradually, I have learned to let go of my "knowledge," so that I may see the beauty that is before my eyes.